Bees and other pollinators are disappearing at staggering rates. In recent years, the term "colony collapse disorder" has been used to describe the alarming phenomenon that could prove disastrous for world food systems. The rampant use of pesticides are increasingly considered to be the prime suspect, but, of course, corporations that produce pesticides are fighting hard to keep their profits, to the detriment of healthy ecosystems. 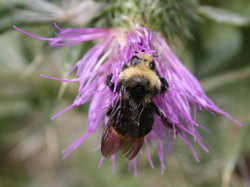 Bumblebee Conservation Trust A UK-based organization that was formed in 2006. Friends of the Earth The U.S. division of this international group currently has some major campaigns to hold corporations accountable.